I first acquired an Indian brand fountain pen / pencil back in March of this year, and wrote briefly about the restoration of one on March 10, 2011. Well, a few months later, I ran across another and was able to swing a trade to acquire it. These never seem to be in pristine condition, but this one seemed to be in fair condition. Below, is a photo of the pen, after taking it apart. You can see that the green pattern is in very good shape. The first thing that jumps out is the dirty nib. After cleaning the nib, it is apparent that it is beyond salvage, and needs to be replaced. Here is where a spare nib drawer comes in handy. Nibs can be purchase on their own, or harvested off of “lost cause” pens. I have a future article in draft on some pens that I purchased for next to nothing due to their horrible condition, but the nib is in great shape and ready for transplant into another needy pen. This Indian an example of a pen (and pencil combo in this case) in need of a transplant. The gold plated nib in the top photo is the original nib to this open and it a pitted and damaged Iridium Gold Plate No. 4. I had a “Very Smooth Made in USA” medium nib which is identical in size and fit perfectly in the section. It is in the second photo below. After polishing the exterior of the pen and pencil barrels, including the clip, lever, and pencil casing, I inserted the new nib and feed into the section. As you can see, the fit was perfect. I then inserted a new size 16 sac into the barrel, still using the old jbar, which was in great shape. The final result is below. In the two photos below, taken with the yellow Indian from the March 10, 2011 post, you can see the different clips on each pen. The yellow pen retains its original “Iridium No. 4” nib. As I mentioned in the first Indian Pen article, speculation is that these were a brand produced by the Arnold Pen Company, possibly in the 1930s. I have no direct evidence of this, but have read the educated guesses. If anyone has direct evidence, please pass it along. I have also seen a red and blue patterned Indian Pens. Be on the look out for them. They are a nice colorful addition to any collection. I waited a few weeks to get to this one, as I needed to do some background research first. As you can see, this is a very good replica of a Parker Vacumatic. Without careful examination of the parts laying on the workbench, one might think this is a 1940s Vacumatic. Well, its not and I will attempt to tell a little about this Wilson pen and walk through the restoration. The first photograph shows the pen after I have taken it apart. I am not sure where the nib is. I noticed it is missing from the photo after I had finished. I do remember that it had faint traces of gold wash on it, and was quite dirty. You can see that it looks quite a bit like a broken-down vac. The filler unit has a plastic plunger, much like the later wartime vacs, with solid metal threading. I was a bit concerned about the clip and cap band. I was worried that they were gold plate like the nib and would polish to a dull silver, but they are 14K gold and polished up well. The repairs went just as with a Standard Vacumatic. I needed to replace the diaphragm and you will note that there is no breather tube. I had purchased tubing from Woodbin (see blogroll) quite a while ago for this eventuality. I cut a piece one inch long and it fit perfectly into the hole in the end of the feed. Having completed that I began to clean all of the parts, not only to make the pen look as close to original as possible, but to eliminate a smell that I had never experienced before in a pen repair. When I initially opened up the pen from both the nib side and filler side, the smell that came forth was one I had never experienced before. I don’t know what caused this, but it was very foul. I made sure to completely remove all remnants of the old diaphragm from the barrel and cleaned the filler as many of the metal parts had old diaphragm and adhesive on them. Having cleaned the filler, which was comparable to a Parker plastic speedline filler, I installed a debutante diaphragm. The pellet holder was the same size as a Parker as the pellet fit well in the holder, after being pushed in with my pellet pushing tool. If was a relief to have the same size parts between the Wilson and Parker products and I did not have to make any modifications. As I mentioned above, the clip and cap band polished up well with my metal polish (I am now using polish purchased from pentiques.com) and look as good as new. The biggest difference is in the nib when you compare the Wilson to a Parker Vacumatic. The nib on this pen is a cheap steel nib. There was a small amount of gold color on the nib when I found the pen, but this immediately polished out. The following two photos show the completely restored Wilson Vacumatic. The barrel reads WILSON VACUMATIC and MADE IN INDIA. As you can see, there is quite a bit of transparency to the barrel as once the barrel cleaned out, the plastic has a nice finish. The details are eerily similar to a Parker. Here is a close up of the clip, band, and nib. The clip is a very close copy of the non-blue diamond vac clips of the day down to the feathers and placement of the name. I have seen examples of Wilson’s that do have the blue diamond on the clip. I would love to handle one to see what the differences, if any, are. The cap band has the familiar cross hatch design and in the space for engraving ( on Parker vacs ) they have placed their name. The nib keeps the same design, but is not 14K gold. As you can see, in an effort to clean it up, the gold wash was stripped away. There was actually little left when I obtained the pen, and what was left, disappeared quickly. In case you can not read the nib it say ~ WILSON IRIDIUM TIPPED ~. The design of the nib is similar to the Parker nibs. Prior to putting the nib back in the section, I checked and a Parker nib fits perfectly. I may be tempted to put one in should I decide to use this pen. 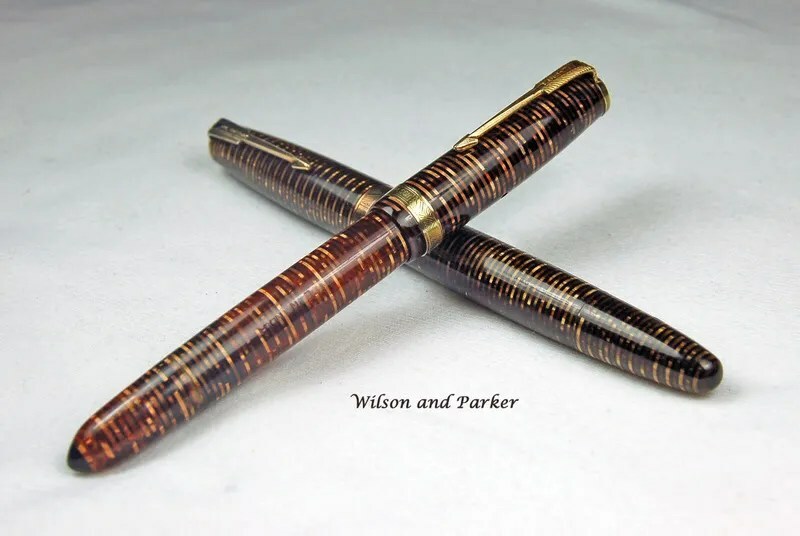 Here is a photo of the Wilson Vacumatic on top of a 1942 Parker Vacumatic in Golden Pearl. The Wilson measures 4 7/8 inches capped and 5 5/8 inches posted. Finally, another picture showing the 1942 Parker on top and the Wilson below. 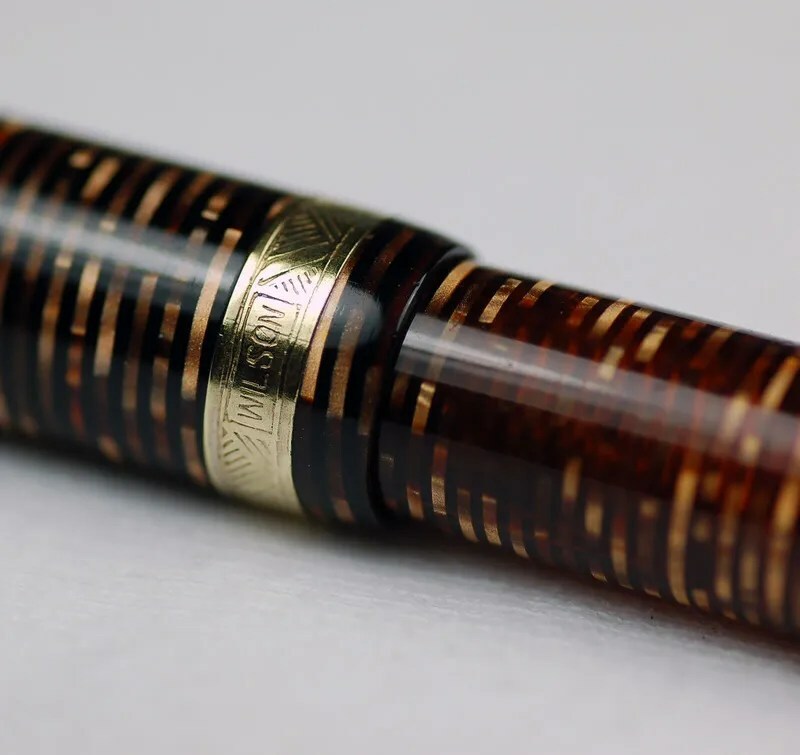 There have been other examples of pens that have emulated the Vacumatic in the past. I think this was one of the best. 10-12-13 Edit: An outstanding piece, written by Purvi Sanghvi, a relative of the founders of Wilson Pens, can be found here. It details some of the history of Wilson Pens!